All tea drinkers know the usual steeping formula: tea leaves + hot water = tea! 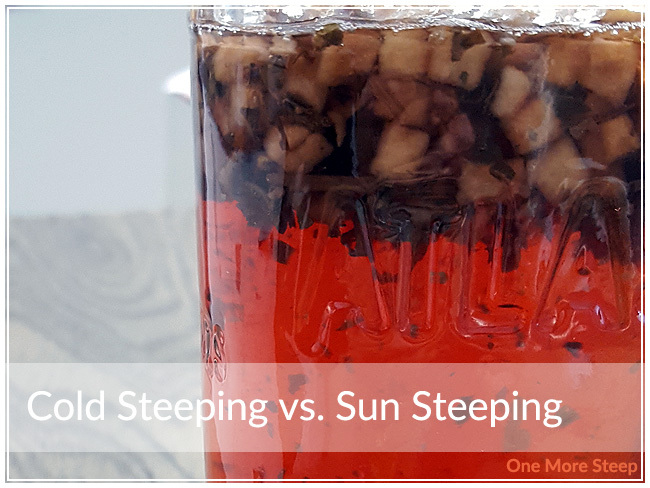 But what about cold steeping (also referred to as cold brewing) or sun steeping? I decided to do a little experiment! I used DavidsTea’s Honeycrisp Apple because it’s a tea that I love hot or cold, and I also had enough to complete this experiment. I use about 1.5x the usual amount of tea leaves that I would use for my regular steeping method. The amount of tea you use is entirely up to you. The benefits to both of these steeping methods is that you don’t run into the issue of bitter or oversteeped tea. Part of the reason why some teas are so tempermental is that they are sensitive to high temperatures and long steep times. I put 2 spoonfuls of the tea into a mason jar and filled it up with room temperature water. The lid goes on, and I put it into the fridge. I started the process at 11pm and strained the tea leaves out at 9am. Total steep time: 10 hours. I put 2 spoonfuls of the tea into a mason jar and filled it up with room temperature water. The lid goes on, and I put it out onto my patio in direct sunlight. I started the process at 11am and finished it at 3pm. Total steep time: 4 hours. Most online references I found for sun steeping or sun steeped tea says to limit steeping between 3 to 5 hours. For both jars of tea, I used a strainer to capture all of the tea leaves. What I was left with was two jars of tea. The cold steeped tea was a nice, sweet tea, it smells just like the dry leaf and has a nice sweet taste that was almost as if I had added sugar or honey (except I hadn’t). The sun steeped tea was considerably stronger in aroma – the apple flavour was quite fragrant. The flavours are stronger, brighter, but not quite as sweet. I think the cold steeped tea requires less cooperative weather, I’m not sure how well it would fare if there was a bit of overcast as I picked a fairly sunny day that had highs of 22°C (~72°F). 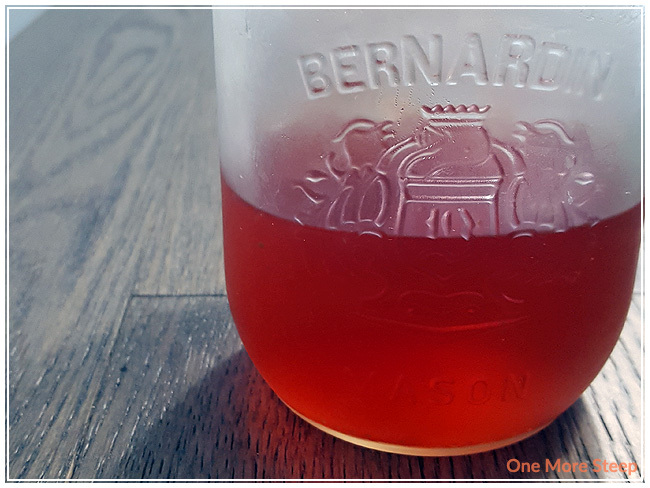 Cold steeping is something that’s easy to do if you do it the night before. Say you wanted iced tea for a party, just set up a pitcher and put it into the fridge. This is easiest if you have drawstring tea bags so you won’t have to strain out the tea later. Both methods result in bitter-free tea, which is great since I did pick a tea blend that has a green tea base. This would be great with any type of tea since it won’t burn the tea leaves during the steeping process. I think both methods would be great for iced tea, just add some cubes after you’ve strained the tea.